Sheikh Saeed Ibrahim was very keen to see my parents. He canceled an appointment to meet them, making sure the opportunity was not missed before they returned to America. He wanted this picture taken, and he wants you to see it. He would be very pleased if you share. “I want the world to see that normal Americans can meet a Muslim leader, and be friends,” he said. “Too many are equating Islam with what they see in ISIS and other extremist groups. I met Ibrahim during training sessions for the Egyptian Family House. He was one of 70 religious leaders – half Muslim, half Christian – learning to be friends with one another and then partner together in their local area to preserve and promote national religious unity. Ibrahim mentioned it is slow going, and that due to various reasons his overtures to area priests have not yet succeeded. So he was especially interested to go international. Not that he has not been active at home. The Azhar is Egypt’s central Muslim institution, perhaps the most influential in the wider Sunni world. Its graduates lead the great majority of the nation’s mosques, and generally control the national religious discourse. 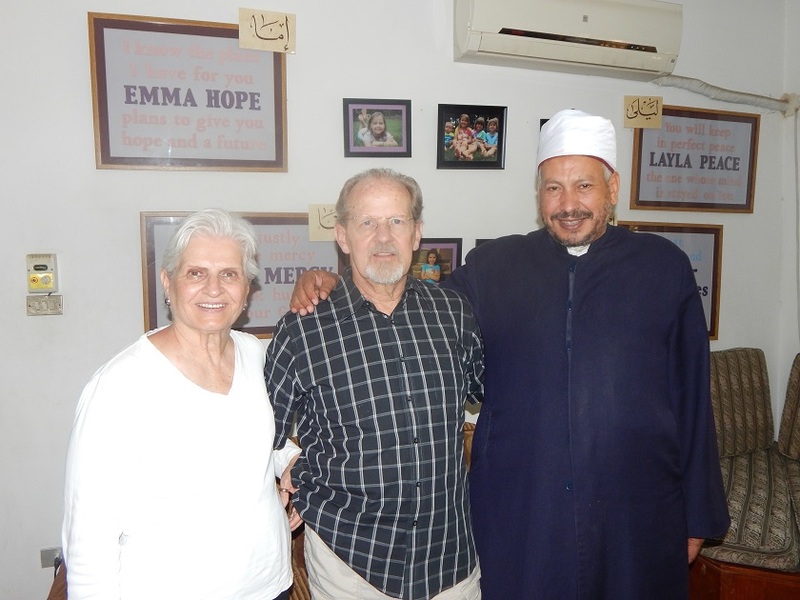 Ibrahim is a supervisor of Azhar preachers in Giza. In addition to this task he delivers a sermon each Friday, offers daily religious lessons, and gives a weekly lecture to police, youth, and women. In recent months he has been especially active. Following the election of President Sisi the Azhar launched a campaign called Love of Country. Following an international Azhar conference last December to condemn ISIS, it launched Eliminating Violence and Terrorism. First, Islam does not know terrorism nor call for it because it is a religion of peace and security. Second, Islam in its doctrine accepts the religious other no matter the religion. Third, Islam treats all people well and with proper morality. So while Ibrahim and his colleagues work to spread this message to Egyptians young and old, he holds a special burden to communicate with foreigners. He wants tourism to return to the country, and he wants the image of Islam to improve. He hopes that as they take pictures together, the world will become more aware. If any in Egypt read this and take note, I would be happy to introduce you. It would be good to draw in also a Coptic priest, and encourage the Family House in working together.